We shake hands often and usually quite unconsciously. Whether it’s a few times a day or a few times a week, we do it when meeting someone or getting reacquainted with someone. or convincingly reassuring; or maybe you’re hinting that you’re not a confident person, are insecure, or don’t care much about being in the other person’s presence. When you shake hands with someone, you should want them to be left with the impression of strength, confidence, power, or of someone in total control of their life. 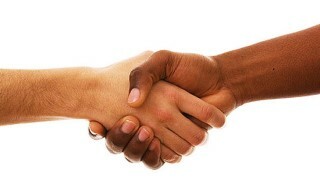 If you aren’t sure about the nature of your handshake have a friend tell you. How do you make it a “good” handshake? Make it firm. You can always use the other hand to reassuringly grip both your hand and that of your boss, colleague, client, or friend. But don’t overdo it and leave them with crushed fingers. Handshakes are very formal, old fashioned things. Forget about the high fives, the Masonic twitches or anything gangster-style. Stick to the traditional style of handshake. Good hand shakers are the ones who proffer their hand first as well as shaking well. They exude confidence by announcing their name and offering their hand at the same time thus showing keenness, friendliness, a relaxed, confident approach, and a general air of assertiveness. They also look you in the eye and say your name back to you. People like hearing their own name and it’s a memory enhancer for you while you are restating their name. In some places of employment, hiring agents have been known to include their perception of a person’s handshake as part of their evaluation during a job interview or when deciding to promote someone to a leadership position. be an indicator of who you are and/or a promoter of your leadership capability.